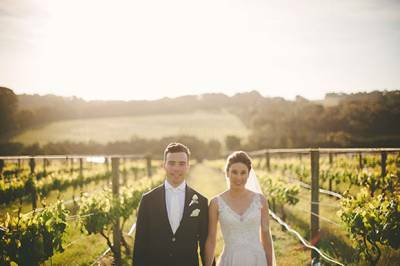 I had the pleasure of meeting Aparat Photography � a brother and sister team from Melbourne � earlier this year at the Nordica workshop, so it's with absolute pleasure that I feature their work on the blog today with this stunning vineyard wedding that took place on the beautiful Mornington Peninsula. 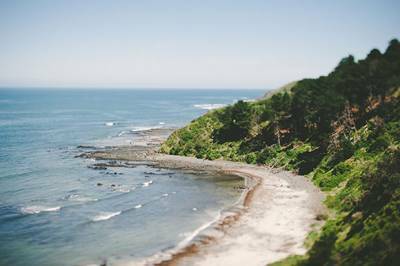 Having spent many weekends and holidays in the area throughout their relationship, getting married in this part of Victoria had extra significance to the couple and they wanted to showcase the area to their visiting guests. Tell us about your proposal: We were living and working in Amsterdam at the time and took a week's holiday to Lake Lugano in Switzerland. We decided to walk to a beautiful lookout point and we came to an opening in the trees where you could see the snow-capped Alps meet the lake. It was there that Tristan nervously got down on one knee. Tell us about finding your wedding dress: After many years of driving past Amalina Vitale's gorgeous shop window in High Street, Armadale and marvelling at her elegant gowns, I made an appointment to finally try some on. I had my mother and sister with me and when I put on my dress, it was perfect. 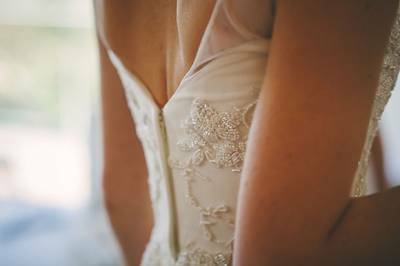 Pretty, elegant and it felt incredible and I knew at that moment that it was to be my wedding gown. 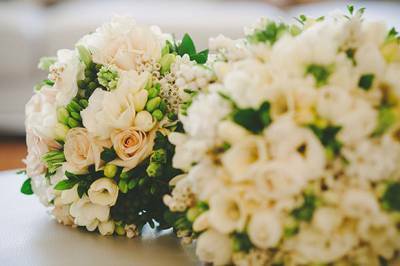 Describe your wedding flowers: My bouquet was soft and rounded featuring mixed spring blooms including freesias, hyacinth, lisianthus and double tulips. We had hanging jars and bottles at the ceremony containing spring florals and a heavy sprinkling of white rose petals for the aisle. Guests were given rose petals to throw as we walked down the aisle. The reception tables were covered with an eclectic mix of jars and lots of candles filled with spring florals. The bridesmaids held bouquets with soft taupe roses, hyacinth and lisianthus. Favourite detail of the day: Our intimate wedding ceremony including the story of our relationship which was a surprise to our families and they loved it. Most memorable moment? The first kiss and dance were special moments but the weather had a huge impact on the day. We had a blue sky, sunny day and when the sun set over the panoramic views of rolling hills and vineyards, we just felt that the day was perfect in every way.